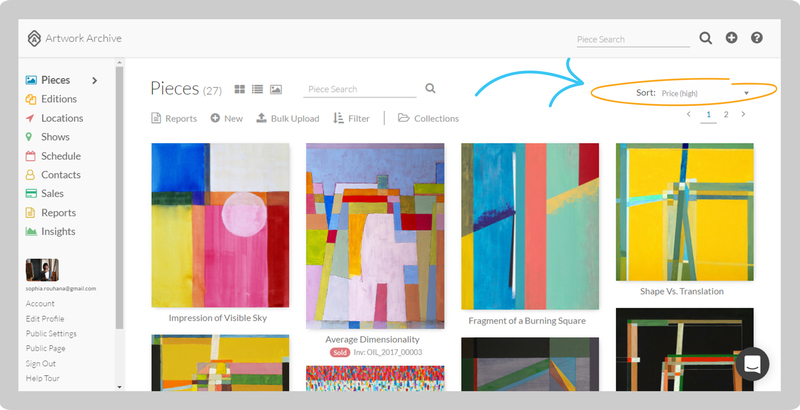 You can customize how you view your artwork and easily find pieces by filtering and sorting your artwork. Use filter to find subsets of your artwork. For example, you can filter your work by type of work (oil painting etc.) to view only that section of works. Use sort to arrange the order in which those pieces are displayed. Select Pieces in the left-side menu. Click the gray Filter button. From here you can filter your pieces based on Status, Collections, Type, Subject Matter, Medium, Location, Creation Date, and Tags. Select Pieces in the left-side menu. Click Sort in the upper right-hand corner. From here you can sort your pieces based on Title, Price, Inventory Number, Size, Creation Date, and Date Added, and Type.